I love everything about the Summer. Lazy days, lemonade, and making memories are some of my favorite things. I love to reminisce about those Summer days past, and also make new memories. 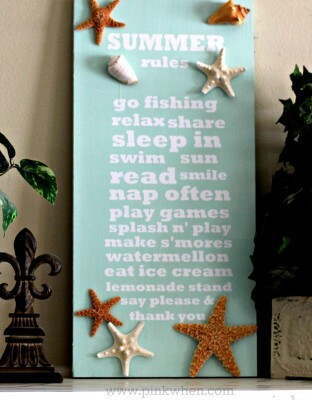 To help do that, I created a fun DIY Summer Rules Sign for the house this year. Sometimes you just have to have a friendly reminder to RELAX. Some of the biggest memories of Summer for me are when I was swimming. Either at the lake, at a friend’s house, the beach, or in a pool. I have some of my favorite memories from the beach. I enjoyed running through the surf in the morning, finding shells, building sandcastles, and playing all day in the water. With this sign, I am planning on our family creating our own Summer memories that they can dream about when they have their own families. Step 1: The first thing I did was lightly sand any rough spots on the board, and then wipe it clean with a damp cloth. I then sprayed a primer. Step 2: Once dry, I applied a coat of Chalky Paint from Americana Decor in Refreshing. Step 4: I loved the way the sign looked when it was finished, but I needed to add a few more things. I grabbed a few shells we picked up at the beach last year and attached them to the board with some Gorilla Super Glue. Once the board was finished, it was time to look around and find the best spot for our Summer Rules. I love it inside on the mantel. I also love it outside around the flowers. Maybe one day I will have a beach house and I can hang it there for all to see. A girl can dream, right? 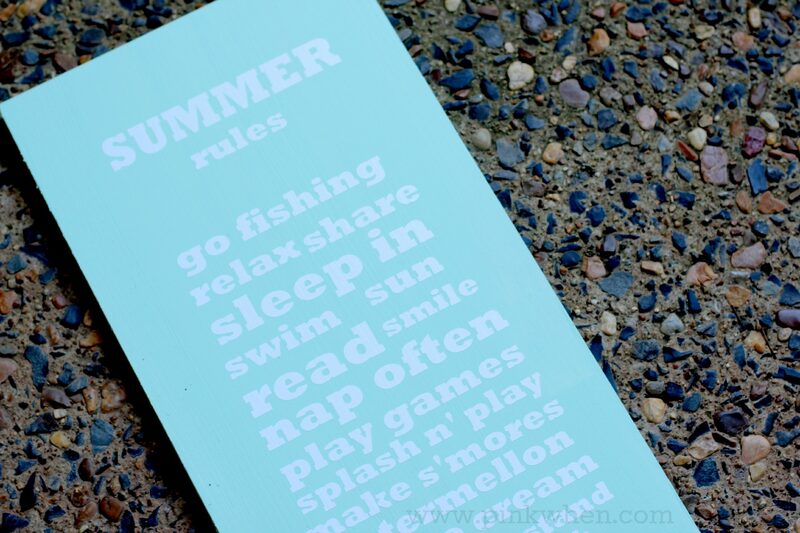 I hope you enjoyed this DIY Summer Rules Sign, and I hope you enjoy your Summer vacation. Really pretty! Been wondering what to make with some leftover pallet wood – maybe something like this would be great. Everyone needs a reminder to relax and enjoy life occasionally! This is so cute. 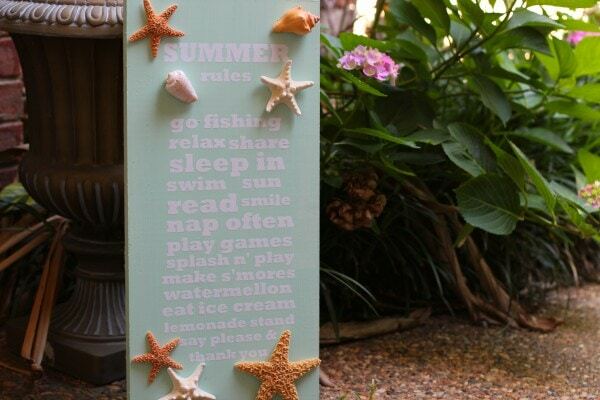 I love the beachy colors ya used & the little shells. So cute! 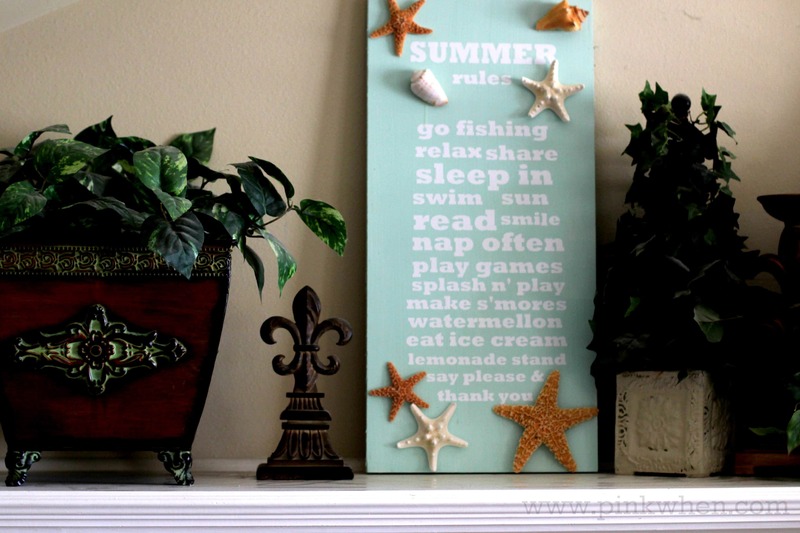 I think this is the perfect decoration for a beach or lake house. It just reminds everyone that it is OK to relax and enjoy! The color is perfect.. that color says “summer” to me! I have the perfect leftover board for this fun Summer Sign! Thanks for the inspiration! I would love for you to share your creativity at my Show-Licious Craft & Recipe Party! We go live tomorrow morning at 8 am EST!